There’s nothing that makes my dog’s tail wag more than saying to him, “Do you want to go bye-bye?” Most dogs love a fun car ride! All the new smells, different sights and sounds are very exciting! But speaking of new smells, well, that can be a problem for your car’s interior. That “new smell” that your dog leaves behind isn’t all that pleasant. Even the most well-groomed pup can leave behind a “doggy smell”, not to mention hair and stains. How do we rid our vehicle of doggie odor? It’s not easy! The first thing we often think of is to use an air freshener or fabric freshener. That works short-term, but the odor is only temporarily disguised. By using these products, you are simply covering up the smell, not eliminating the source. To truly get rid of the odor, we need to get to the source of the problem. That means we need to remove the residue – yeah, the gross stuff – that the odor is clinging to. Fortunately, most dirt and mud doesn’t smell all that bad, but sometimes a mud puddle that has been standing for a while can become stagnate and smell like raw sewer! Gross! Let’s say you and your pup just had a fun day at the James River. And before you can stop him, he has jumped in the back seat of your car slopping mud all over your fabric interior. Don’t panic. Mud and dirt is actually easier to get rid of than other doggy “deposits”. First of all, don’t attempt to clean the mud off while it is still wet. If you try to clean the fabric while the mud is still wet, you will only push the dirt particles further into the fabric weave. After you take Rover home, open the doors of your car and allow the mud to dry. Then brush or vacuum the dirt. Generally, that’s all you will need to do. Sometimes mud leaves a stain. There are several things you can try to remove stains from your upholstery. There are a lot of good products on the market. My favorite is a foam specifically made for automobile interiors. But first let’s try to remove the stain with what you probably have in your pantry. If you’re lucky, sometimes a stain will lift by simply blotting it with a wet towel. If that doesn’t work, add some mild laundry detergent to it, and again, blot the stained area. Some people find that a vinegar and water mixture works well to remove stains. The key is to blot or dab the stained area gently. No harsh rubbing. Rubbing could actually work the stain further into the fabric. With any stain, it’s better to try to remove it as quickly as possible. Stains become more permanent the longer they are left in the fabric. • With baking soda, mix 1 part soda with 2 parts of water. Take a clean rag and dip into the solution. Then dab the stain, covering the entire area. Allow the solution to remain on the stain for at least 30 minutes. After that time, “rinse” well. By rinsing… I mean dabbing with a thoroughly wet rag, turning it often, and rinsing the rag often. I don’t mean to take a hose to your car’s interior! Afterwards, continue the dabbing and blotting with a fresh towel to dry. • Meat tenderizer actually has an ingredient that breaks down the proteins in blood. Who-da-thunk-it? To remove stains, mix 1 part of tenderizer with 2 parts of water to make a paste. Use your fingers to work the paste into the stain. Leave the tenderizer on for 1 hour. The paste will dry by then and you can brush off the excess. Then take a clean, damp rag and dab continuously, lifting (hopefully) the stain onto the rag. Then dry with a fresh towel. • Some people have good luck with a cold salt water solution. Add 2 teaspoons of table salt into 1 cup of cold water. Dip a clean cloth into the salt water solution and dab at the stain, turning and changing your cloth often. Work from the outside of the stain, moving towards the center to prevent spreading the stain even further. Repeat until you are not longer absorbing any stain up into your cloth. “Rinse” thoroughly (with a thoroughly soaked clean towel) dabbing the area until all the salt solution is removed. Dry by pressing a dry towel onto the area. I know, I’m dry-heaving just thinking about it. Vomit is acidic and can actually damage the car’s interior. As tempting as it would be to just open the car doors and let nature have a stab at it first, you really need to hop on it sooner, rather than later. Wrap a scarf around your face if you can’t deal with the smell. The first thing you need to do is remove the solid matter. That’s the worse part. The easiest way is to cut a paper plate in half and use the straight edge as a scraper. Scrape the solid matter onto the plate and just throw it away. Some people use tools – likes spatulas or paint scrapers – but then you have to wash those. It’s much easier to be able to just throw away the scraper. After that, you need to remove the moisture. This is done by pressing paper towels into the upholstery to pull out the liquid. Don’t press too hard or you’ll just push it further into the fabric. You could use towels or cloths to absorb the moisture, but again, you’ll just have to wash them. Make it easy on yourself and just use good-ole disposable paper towels. To remove the vomit odor, cover the entire area with baking soda. Let that sit on the fabric for about 30 minutes, then vacuum it up. Now you can take that scarf off your face! Next, we need to wash the upholstery. You can use a commercial product specifically designed for cleaning car upholstery, as we discussed before, or you can make your own cleaning solutions. Many people have good luck with a mixture of warm water, dish-washing liquid and vinegar. Spray it on and let dry. This will help remove any stains. After it dries, spray the area again with your cleaning solution and scrub lightly. So as not to damage your fabric upholstery, choose the softest scrub brush you can. Toothbrushes are good. Vegetable brushes are also good. After scrubbing, blot with a wet rag (not “sopping” wet) until the solution is removed. You should be “good to go” now, but for more stubborn vomit stains, you may have to repeat the process. I might also recommend steam cleaning. You can buy the small home-version or rent a commercial steam cleaner. Holiday Barn Pet Resorts pack member, Stacey, shared this idea: To remove odor from upholstery, use cat litter! First, dampen the upholstery with a light spritz of water. Cover the area with an odor-absorbing cat litter. Let stand over night and/or until completely dry. Then vacuum up the litter! She said she has done it and it really works! With all that dabbing and blotting, cleaning your upholstery is very time-consuming. You’re lucky if you have a wipe-and-go upholstery like leather, pleather, or vinyl. Leather can be tricky, however. I highly recommend you check your owner’s manual for care instructions. You sure don’t want to permanently mar that beautiful leather. I’ll be honest with you, hair is really, really hard to get out of many upholstery weaves. I had an old Nissan Sentra that my beagle accompanied me in often. I never got rid of all of her hair. Truthfully, I never got rid of her odor either… but I was a teenager and that really didn’t matter all that much to me. Many of today’s upholstery is not so much a “weave” but more of a “flat” finish. That’s a good thing. That means that vacuuming will remove the majority, if not all, of the hair from the fabric. If not, there are a few things you can try. • Tape or lint rollers are great tools for removing hair from the surface of the fabric. With tape, packing tape or duct tape works best. Wrap the tape around your hand with the sticky side out (duh) and then press to the fabric to pull away the hair. • Here’s a cool idea! Add a few teaspoons of fabric softener to water and spray your upholstery with it. Supposedly, the fabric softener will loosen the hair. After it dries, simply vacuum it up. I’ll bet it makes the car smell nice too! • A rubber glove is recommended by many. Choose a glove with “nubbies” on it – like the ones you use for washing dishes. Then just start at the top of your car’s seat and vigorously rub from top down, loosening all that hair. Pretty cool, huh? • I have read that a dryer sheet removes pet hair from upholstery. I don’t really understand how, but anything is worth a try, right? Remember what Mom always said: “An ounce of prevention is worth a pound of cure”! She was so right. 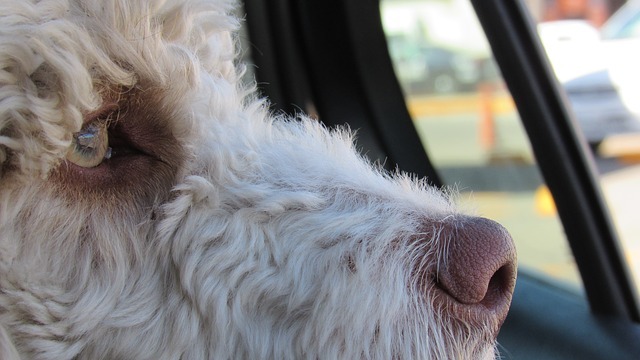 Even the best canine travelers can leave behind a “doggie” odor or have an accident in the car. It’s always best to be prepared. What are some things you can do to keep from spending hours blotting, dabbing, rubbing and gagging? • Use a seat cover. There are so many nice seat covers designed specifically for dogs on the market now-days. Many are waterproof. Seat covers can totally protect your car’s upholstery from dirt, stains and hair. There are several that can be tossed in the washer too. How convenient is that? • Don’t have a seat cover? How about a beach towel? Beach towels are larger and cover better, but any bath towel will do. Cover the seats before any trip with your furry friend. When you get home, just pop ‘em in the washing machine! • Unless you wash it every day, your dog’s bedding probably doesn’t smell all that great. If you don’t have time to thoroughly wash your dog’s bedding prior to a road trip (maybe Rover is coming to stay in the Holiday Barn Pet resorts suites? Yay! ), tie the bedding up in a large plastic bag. You can place some odor absorbers or sachets in the bag to help with any unpleasant smells. • Keep your pup contained to one area of the vehicle to keep from having to detail the entire car! Use a dog seat or a seat-belt to restrain your pup. It’s safer for him, and it’s much easier to clean one side of the back seat than having to do a full detailing. • Provide good air circulation in your vehicle when you have your little furry odor-maker with you. Crack the windows or turn on the ventilation or A/C system. Fresh airflow helps to disperse and eliminate odors. • This goes without saying, perhaps, but keeping your dog clean really does help with the doggie odors that can be left behind in your car. Bathe him frequently or bring him to the groomers at Holiday Barn Pet Resort. We have some amazing spa products. Your pup will come home smelling fresh and sweet! • To prevent your dog from having an accident in the car, whether it be eliminating or vomiting, take some precautionary measures. Of course, you’ll take them out to potty before the big trip, but you should also make frequent potty breaks along the route. Sometimes the anxiety of a trip can make your pup have to “go” more often. Also, to avoid vomiting, don’t feed your dog for at least a couple hours before putting them in the car. Happy tails … I mean trails, to you! Error: Error validating access token: Session has expired on Monday, 29-Oct-18 09:08:51 PDT. The current time is Thursday, 18-Apr-19 20:11:01 PDT.